This month’s food photography challenge for our food photography group, The Inspired Plate, was to let a magazine cover give you inspiration to create a cover of your own. I had a fun time with this one. Frustrating and fun at the same time, you know? 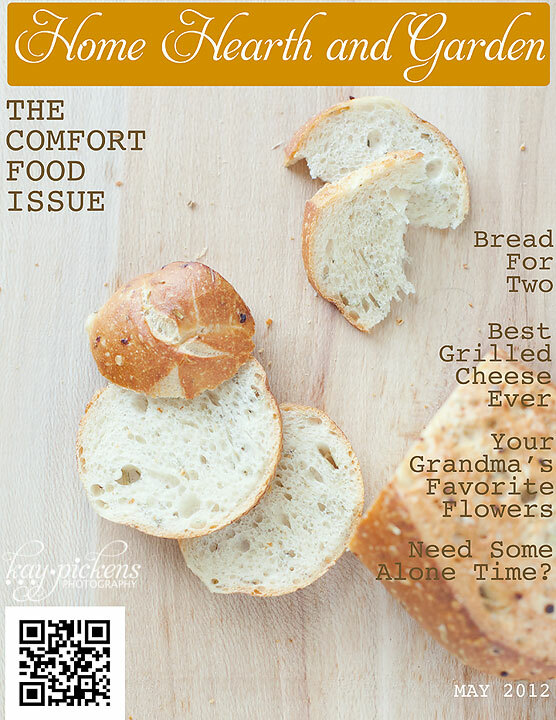 So I had seen a food/cooking magazine that had just used bread on its cover. Nothing more. No props. Simple. The image of the cover stuck in my mind. Well, since I’m a prop kind of gal, that seemed like a good challenge for me to shoot without props. Though I love to bake, my husband is on a low carb diet so I was loath to actually bake bread in the house with its wonderful aroma. I’m just not quite that mean. I do miss baking bread though, and I’m afraid I’m going to have bread baking extravaganza next time he’s out of town. I picked up this small loaf at our HyVee store that has a whole table of “bread for two”–small loaves of bread. Love that they have the smaller portions there. Since it just wasn’t in me to completely NOT use props…I did these quick set ups too. Love that small teal rimmed plate! I used a piece of white bead board and a scratched up teal cutting board. I still tried to keep in mind some open space in these two photos for room for a magazine title and article headlines. This was a fun project and it was challenging for me to use just the food and no props for the cover. You know, until I cheated and pulled out some props for more photos of the bread. Jump around our blogging circle and see what everyone came up with. Visit Kat Clark and see her take on the challenge this month. Great job, Kay. 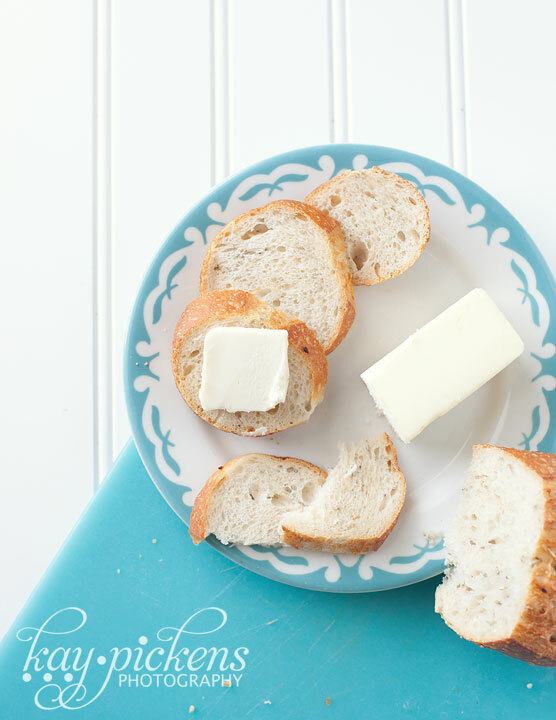 Love the choice of blue to go with the crusty bread. Bread and butter, I could live on those alone! Gorgeous cover!! You are SO talented! I love the simplicity, the earthiness and the rusticness of this cover. The detail on the bread is great and it Excellent choice of background as well. Nice job! Kay… I love the simplicity of your shot! And yes, I love your titles as well. The creativity is the fun part! 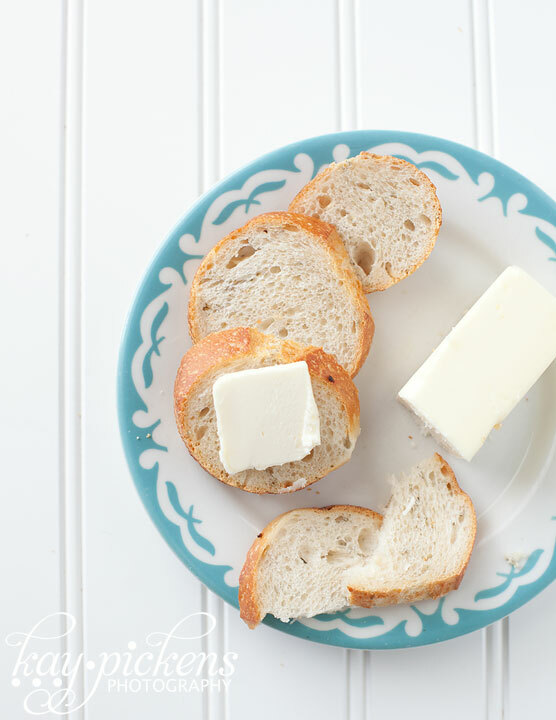 I’m working on the reduced carbs as well, but you have me wanting to toast up a baguette and eat it all myself. I’d totally buy this magazine simply because I loved the cover!